​Jeanne-Antoinette Poisson, the Marquise de Pompadour, is a fascinating and iconic character in both French and world history. She seemingly had it all: good looks, elegance, smarts, as well as some less laudatory characteristics including ambition, a bit of blindness where the King was concerned, and a vindictive streak. She also had another, very surprising characteristic: kindness. I think that at the end of the day, despite becoming the most powerful woman in France and one of the most powerful in Europe, she was fundamentally a nice person whose heart remained more or less in the right place. 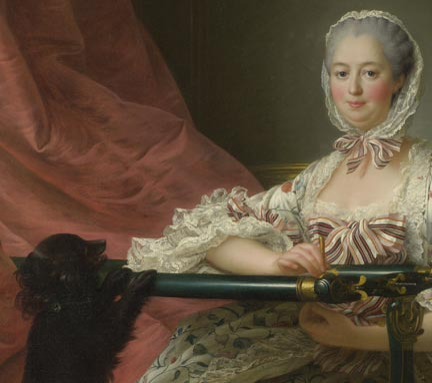 She had an incredible impact on so many areas: she sincerely loved the king and gave him more confidence and created a delightful life for him at Versailles; she supported the arts and culture; was very philanthropic, and also heavily involved in politics and intrigue. Some historians, especially the Victorians, have decried her 'meddling' in politics, and even Nancy Mitford in her seminal biography, published in 1953, chastises Pompadour and says she had no more aptitude for politics than most ladies. Ouch. I believe Pompadour was at least as capable as the next minister, for all if not most of her contemporary politicians were out for self-advancement and self-aggrandizement, and in a political system built off of nepotism and venality, not many had any core capabilities to begin with. Jeanne was “the perfect package” as we might say in modern-speak. She wasn’t a stunning beauty, but apparently the whole of it - pretty eyes, a lovely complexion, beautiful hair, elegant arms and wrists, a nice bosom (! ), elegant manners and a bright way of conversation - made her an incredibly attractive woman, the “morsel fit for a king” that she was raised to be. This is perhaps her most iconic portrait, and it's not so much about her as about that dress and the overall effect of everything around her: the books, the clock, the writing desk, the dog, and again, that dress. This portrait is a good example of the height of the Rococco style, that glorious, swishy, curly, over the top style of mid 18th century. This portrait is by Francois Boucher and was painted in 1756. This is my personal favorite. Here she is dressed as Diana the Huntress, with her bow and arrow, which was how she dressed for the Ball where she met the king. I saw the original during my backstage tour of Versailles (read about it here) and it is absolutely luminous. This is an early portrait of her, by Jean-Marc Nattier from 1746, and I think this is the only one of her represented mythically (most of the pictures of the Mailly Nesle sisters are in that form). By the mid 18th century that fashion was dying out. ​Another favorite, I love the overall delicateness and the direct look of her gaze, which holds just a hint of a challenge. Notice her bracelet - matching her ribbons! - with a silhouette of Louis XV. Her? Really? A less flattering portrait by Andre Van Loo from 1755, when she was 33. Writing Pompadour was a challenge. She really was everything to everybody, and very elusive to capture, either in paint or on the page. Every time I asked her who she truly was, she would turn around, smile, and ask me who I wanted her to be. In addition, the sheer amount of facts and history known about her life is challenging for a fiction writer: the temptation becomes to write to events, and then you wind up with a chronology of events, and not a story. I had to become ruthless and learn to say, even if something was a part of her life, there was simply not room in the book for everything. Click to read about some of the omissions in the book and click through to Resources & Research for some recommended readings if you're interested in learning more about her life.